In commemoration of the 55th anniversary of President John F. Kennedy’s moon speech delivered at Rice Stadium, Fred Haise will speak about the history of the United States manned space program and the harrowing story of the Apollo 13 mission. The lecture will be followed by a brief conversation on the future of the U.S. space program featuring Ellen Ochoa, former astronaut and the director of NASA’s Johnson Space Center, David Alexander, the director of the Rice Space Institute, and Fred Haise. After an explosion forced Haise and fellow crewmen Jim Lovell and John Swigert to abort the Apollo 13 moon landing, the three astronauts piloted their damaged spacecraft back to earth while fighting failing life support and flight systems. Six days after their launch into space, the astronauts splashed down safely in the Pacific Ocean. For their remarkable bravery and service to space exploration, Haise, Lovell and Swigert were awarded the Presidential Medal of Freedom. Haise remained at NASA until 1979, playing a critical role in the space shuttle program as a test pilot for the orbiter Enterprise. 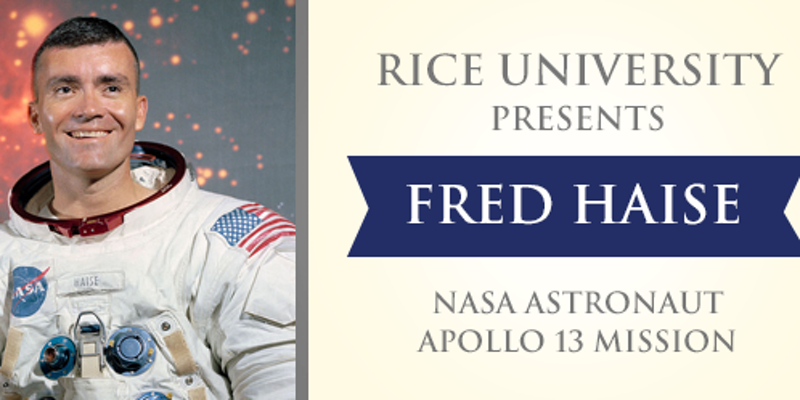 Read more about his celebrated career as an astronaut and pilot at jsc.nasa.gov.